Seven years after tearing down the old airport hotel, Sacramento International Airport has reached a deal with a private developer to build a new facility on site – a five-story hotel that will sit within short walking distance of both passenger terminals. The deal, years in the making, will provide airport customers with a privately built 135-room Hyatt Place. The hotel will include an indoor pool and spa, fitness room, dining area and 3,500 square feet of meeting space. Airport director John Wheat called the hotel deal a double bonus, returning a major passenger amenity to airport grounds and providing a needed income boost. Airport officials have sought ways to boost revenue to pay down a $1 billion debt load from the recent construction of a new terminal and passenger concourse building. The developer, Sonnenblick Industries LLC of Southern California, has been negotiating for two years with the county on the deal. Sonnenblick , the sole company to respond to the airport’s request for proposals, specializes in government buildings but has built a number of hotels and increased its hotel development in recent years. The airport tore down the previous on-site hotel in 2008 to make room for Terminal B. Officials had originally planned to build a new hotel several years ago as part of the Terminal B expansion project, but were forced to eliminate it as a cost-saving move during the recession. Until recently, the airport and other Natomas-area landowners have been unable to build new structures because of a de facto building moratorium until flood improvement funding was authorized. That moratorium appears ready to be lifted this spring or summer. Airport officials will present the deal to the county Board of Supervisors on Tuesday for approval. 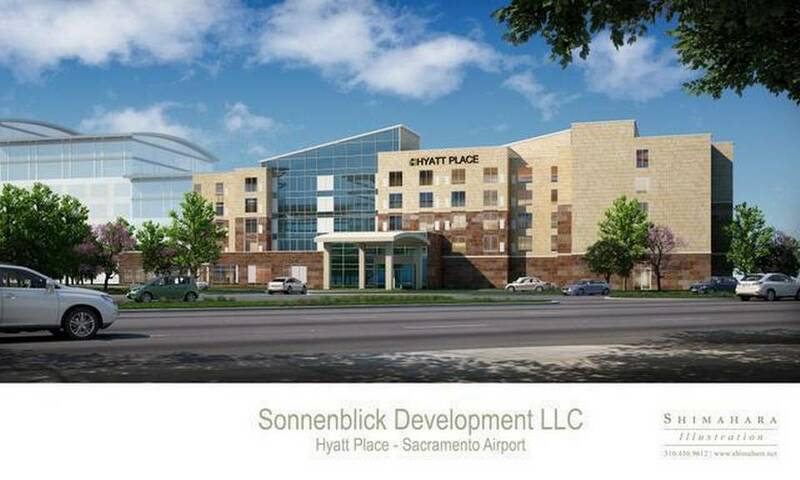 According to a staff report for that meeting, Sonnenblick will build the hotel on a 1.4-acre site it will lease from the airport next to the parking garage. The developer will pay the airport a one-time fee of $2.46 million to use 164 ground-floor spaces in the garage for guest parking. The company also will pay the airport an annual $900,000 in rent for the first four years. In year five and beyond, the rent will be set at a percentage of hotel gross revenue, estimated to be about $475,000 in year five. The hotel construction cost, to be borne by Sonnenblick, is expected to be about $24 million. Construction is expected to take two to three years. The hotel site will be on a triangular grassy area, currently unused, at the north end of the parking garage.